Certificates are available for gaining 100, 250, 500, 1000 points . These handsome certificates are printed in colour and are personally signed by a member of the SOTA Management Team. 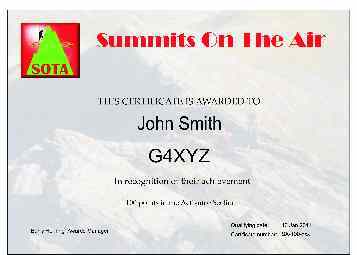 Each certificate is individually numbered and printed with your own callsign or SWL number. Endorsements such as "All CW" or "VHF" can be added on request at no extra charge. The certificates are posted to you in a board-backed envelope to ensure that they arrive in good condition. For those with boundless energy and enthusiasm there are additional certificates for 2,500, 5,000, and 10,000, and even higher points.